October 17, 2014: She was like sunshine. There’s people in this world, and inside they’re angels. They carry their own light ‘neath the skin and their wings are tucked up small under their shirts or their dresses. And every now and then they shed feathers, like birds in a summer moult, and those feathers are soft as thistledown and silver and they lift on the smallest breath and float to the far corners of everywhere. But if you catch one before it touches the ground, then it’s still silver and it holds a wish if you close your eyes and put your heart and soul into wishing. He showed me a feather, as if it could be counted proof of the truth of what he said, but it just looked like an ordinary feather to me. And he said they sing with the sweetest sound, like a whole choir in one voice. I wanted to ask him what it was he’d wished for and if it had been granted in this world or was a promise for the next, but I didn’t. And that brings me to Lorri. 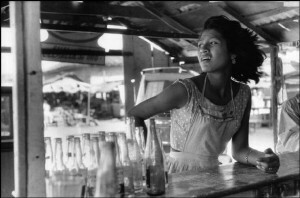 She serves bottled beer from a stall in the market, cold and sweet and clean, and just what a body needs on a hot-as-ovens day. Sometimes, if you just turn and catch her without her noticing, and the sun’s on her, well she’s pretty as take your breath away. I tell her she’s pretty some days, when I’ve had enough beers I am braver than I am sober. She laughs and she shakes her head like I’m talking nonsense and she serves me another beer, no charge. And I catch her singing sometimes and it’s like a spell pulling at my insides it’s so soft and so beautiful. I want to say it’s like church singing, but it’s something more than that. Like hearing a song carried on the air from a long way off and all the words are blurred and there’s just the music made by a voice. Maybe that’s the drink talking, but I swear I could listen to her all day and everyday. Lorri, and I see her sometimes, rubbing at her back and adjusting the straps of her dress and I think about what that old man said ’bout their wings tucked up small under their clothes. That can’t be comfortable for them, I reckon. And I look for light in her eyes, sparking and pure, and I tell her sometimes that she’s an angel. Then one late afternoon and it’s breathless hot and most of the town is sleeping in the cool shade, and me, I’m onto my sixth beer, and Lorri comes over, dancing between the tables, and she says she’s got something for me, and she brings from behind her back a single feather. It’s silver and perfect. And she lays it on the palm of her hand and she blows, like she’s kissing the air between us, and that feather carries into the air, and I know I’ve gotta catch it before it hits the ground or it’s just an ordinary feather then. That was years back, but I still swear that girl’s an angel. I keep that feather tucked into my wallet and one day I’ll maybe have something to wish for. Right now I’ve got beer, and Lorri singing, and she’s still pretty though the years are showing – it don’t get any closer to Heaven than this. I’m telling you for your own good, so you can look out for angels, too. Don’t take my word for it, look ’bout you.